Experience a breathtaking physical act within a forgotten historic space in Manchester’s oldest urban quarter. Switch and Tipping Point begins next week and we can’t wait to take over Manchester’s historic Upper Campfield Market Hall. Whilst our usual home on Oxford Road is under major renovation, we’ve taken the opportunity to explore the incredible variety of performance venues, both conventional and unconventional, that Manchester has to offer. Following on from the success of our daring spring production of Handlooms, which was intimately performed in a sari shop in Rusholme, we are thrilled to be presenting this aerial double-bill in stark contrast in a vast disused grade two listed Victorian market hall in Castlefield. 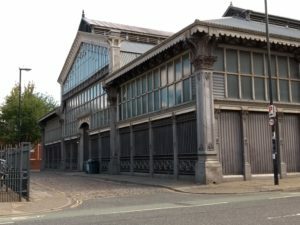 Built in 1880 directly next to the oldest train station in the country, Liverpool Road, Lower Campfield Market Hall has been occupied by the Museum of Science and Industry since 1983. Upper Campfield Market Hall has had a colourful history, being used as a trading floor, an exhibition space, a temporary theatre space, and even during WWII as a Barrage Balloon Factory. In recent years the magnificent building has remained mostly unoccupied, but for a few food events, commercial location shoots, private parties, and one notable visit from Manchester International Festival in 2017. Switch and Tipping Point, breathes life back into this incredible space and pays tribute to its largely forgotten history of housing the The Royal Exchange Theatre after an IRA Manchester bombing in 1996 severely damaged their premises on Corporation Street. The Royal Exchange performed for two years in this makeshift space and returned in 1998 with a historic performance of Stanley Houghton’s Hindle Wakes, the very same production as had been due to perform on the evening of the bombing, two years prior. The cast iron pillars, ornate arches and gothic veranda of Upper Campfield make for both a spectacular setting and most fitting backdrop for Ockham’s Razor’s spectacular Tipping Point. High above the ground but contained within their tight chalk-drawn white circle, the literal and historic surrounding empty space resonates through the acrobats’ stories of divisions, barriers and integration in our lives. Doors will open an hour before each performance to give you time to tuck into some delicious treats and enjoy a drink before the show. Make sure you arrive in time to soak up the carnival atmosphere created by food and drink stalls before taking your seat. A thrilling double bill fusing circus, dance and physical theatre. Switch is commissioned by Contact, with funding from Calouste Gulbenkian Foundation ‘Sharing the Stage’ programme. Tipping Point is produced by Turtle Key Arts and commissioned by London International Mime Festival and The Lowry.